Okay, go grab the sides of your chair to reorient yourself. It's an amazing work of art. OK Go is no stranger to stunning visuals in music videos, as seen with their Here It Goes Again video. After watching their latest video, and reorienting myself, I knew I had seen similar art in a parking garage of all places. I've never visited Melbourne, Australia's Eureka Tower Carpark, but I stumbled across pictures of it at one point while researching ways to incorporate art and design into the traditionally utilitarian design of parking structures. Eureka Tower Carpark has some amazing illusions as you drive through, which double as navigational signage. Go ahead and take a tour and see for yourself. It was the work of Australian artist Axel Peemoeller, who apparently channeled his inner M. C. Escher, the Dutch artist who may be most widely known for his Drawing Hands piece. The directional signage in the structure brings some fun to a normally drab environment. Upon doing further research for examples to spruce up parking structures, I found an ambitious marketing strategy in South Carolina from the Greenville Literacy Association annual book sale. Their marketing consisted of a collection of book scenes throughout a local parking structure, as well as an optical illusion visible only from the city's Main Street Bridge. 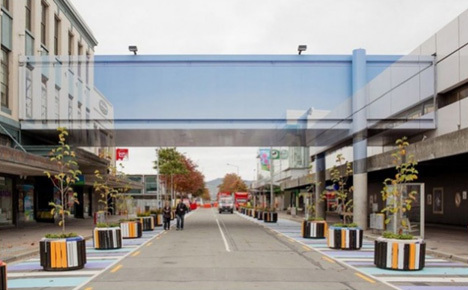 There are many other examples of urban optical illusions, like these in New Zealand from artist Mike Hewson. Who says that public infrastructure can't be both functional and fun?! I don't know whether the Eureka Tower Carpark is the best parking structure in Melbourne, Australia, but it must be the most talked about. Even people around the world know about it, simply because of a little bit of fun, vision, and a few cans of paint. No one can have a perfect idea about all of these because according to a dissertation help company, there are still lot of other things that can be suggested.